Lately at our Patchwork & Quilting Friday morning house groups there has been a lot of knitting! I picked up a basic pattern for a triangular shaw as demonstrated by one of the Ladies. Using double knit weight yarn (I chose a Patons Silky random dyed) and needles, size 4 or 4.5mm, cast on 3 stitches. Working in stocking stitch increase by one stitch at the beginning of every knit row until you have 100 stitches. Then decrease 1 stitch at the beginning of every knit row until you have 3 stitches left. Cast off. Decorate with beads, buttons, tassels, trims – anything that takes your fancy! 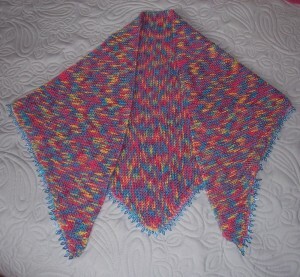 I worked my shawl in plain knit stitch for every row and made the increases and decreases at the end of alternate rows. The shawl took just over 200 grms of yarn and measures approximately 54” at its widest x 21” deep to the apex. I “pimped” up my shawl by adding some irridescent plastic beaded trim on a fine string heading that I have had in my stash for about 12 years. I knew it would come in handy some day!